You popped the big question, she accepted the proposal, families got involved and planning for the big fat Indian wedding begins. If you think the wedding planning process will be as easy as arranging the surprise proposal, wake up! It’s not going to be as rosy as you think. Sorry to burst your bubble, we’re just trying to save you from all the drama and trauma you’re about to witness. Of all the major decisions for your wedding, the venue is what ultimately takes the cake. Since the major portion of your wedding budget is going to be swallowed up by the venue itself, choose wisely. For couples planning an upscale wedding, scouting for the perfect five star wedding venues in Mumbai can be as easy as pie, as each and every property is optimally located and offers best-in-class service. But, what of custom preferences and other minor planning details? Questions or rather worries like, will the venue fit your wedding theme? Does it have a great passage area where you can make your striking bridal entry? Does it have a good stage area to host your extravagant sangeet? And so on and so forth. 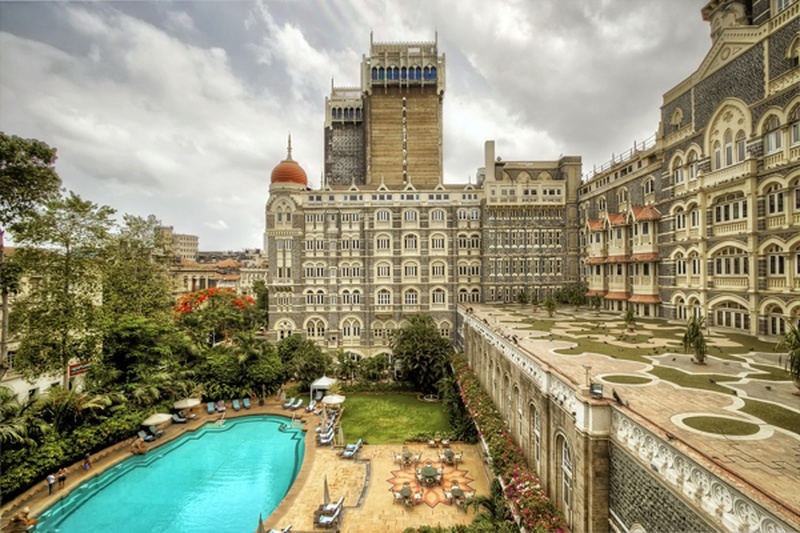 From heritage sites to destination wedding venues, here are our handpicked five star wedding venues in Mumbai perfect to host your royal and majestic wedding festivities. How does the thought of celebrating your wedding at Mumbai’s first harbour landmark sound? Over-the-top, isn’t it? From your engagement to your wedding and all things in between, The Taj Mahal Palace can handle any function with great style. Whether it’s a traditional wedding or an extravagant celebration you’re hosting, their expert in-house team of wedding planners ensure your event doesn’t fall short of perfection. Choose from their exquisite indoor and outdoor banquet rooms that overlook the Gateway of India. The exquisite accommodation offered for outstation guests will surely not disappoint. And let’s not forget their world-renowned team of culinary experts who serve dishes that offer heavenly bliss in each bite you take. One of the classiest picks for outdoor weddings, Novotel, Mumbai, Juhu Beach offers a breathtaking poolside lawn that gives a magnificent view of the Arabian Sea. If you ever dreamt of having a sea facing wedding and imagined you and your spouse-to-be taking vows in a twilight setting with the tender breeze of the sea calming your wedding jitters, this banquet hall in Andheri, Novotel does full justice to making your dream come true. For indoor weddings, the hotel offers luxurious banquet facilities that can accommodate small as well large gatherings. To take care of every detail of your big celebration, the hotel offers customised event management services. Well-known for the largest grand ballroom in the city, Sahara Star, Mumbai is the ideal wedding venue in Vile Parle to host your big fat Indian wedding. And what makes it even more preferable is that this humungous event hall comes at very good price. How huge is their ballroom you ask? We’re talking about a whopping 55, 000 sq. ft. of space at your disposal. So if you want to accommodate a large number of guests in cluster style table seating in an indoor space, no better place than Sahara Star, we say. With a team of award-winning chefs and highly trained personal butlers, you’re guaranteed to enjoy world-class cuisine and remarkable signature beverages. ITC Maratha gives you an old world charm with a twist of contemporary that keenly reflects in their architectural features and hospitalities. The cuisines, accommodation and recreation options available at the venue are heavily inspired by the Maratha dynasty mixed with European sensibilities. An affordable venue option of the lot mentioned in the listing, ITC Maratha is ideal for hosting your wedding festivities if you want to give your guests a taste and glimpse of old-meets-new charm. Another major attraction of the venue is its award-winning cuisines and beverages that include Indian, Continental and East and South East Asian culinary and some of the world’s most appreciated beverages. A new property on the block and fast making its way into the list of top five star wedding venues, we have JW Marriott Mumbai Sahar that offers stunning indoor and outdoor venues in the hub location of Mumbai, Andheri. From wedding hall selection to mouth-watering catering, its expert event management team helps you host a splendid celebration. For uncompromised luxury, nothing beats this brand new hotel. One of the finest destination wedding venues in Powai you can find in Mumbai, Renaissance Mumbai Convention Centre Hotel is nestled at the banks of scenic Powai Lake and offers 230,000 square feet of versatile indoor and outdoor spaces at your disposal. Host a shaandaar wedding with all your loved ones in town. You can opt for their grand ballroom, which is one of the largest ballrooms in Mumbai or host a romantic outdoor wedding on their terrace or at the shore of the lake. Their in-house wedding planners will assist you with your venue and décor choices. Their team of culinary experts put up customisable wedding menus for lunch, dinner, as well as breakfast. For guest accommodation you can select from their 12 impeccably designed hotel rooms and suites that offer sheer luxury.